Columbia University Press, 9780231170444, 272pp. Where are the next decade's greatest investment opportunities? Veteran investor Marko Dimitrijevic argues that they can be found in frontier markets, which account for seventy-one of the world's seventy-five fastest-growing economies and 19 percent of the world's GDP. Yet many investors ignore them. Fueled by new access to technology and information, frontier markets are emerging even faster than their predecessors, making them an essential component of a globally diversified portfolio. 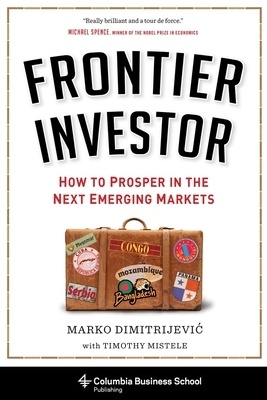 In Frontier Investor, Dimitrijevic shows through colorful case studies, compelling charts, and fascinating travel anecdotes that it is not only possible but prudent to invest in these unfamiliar and undervalued options. Dimitrijevic explains how frontier markets such as Nigeria, Panama, and Bangladesh are poised to follow the similar paths of Chinese, Indian, and Russian markets, which were considered exotic two decades ago. He details a strategy for how and where to invest, directly or indirectly, to profit from frontier growth. Dimitrijevic covers the risks, political and otherwise, of these markets, the megatrends that promise exciting investment opportunities in the coming years, and the prospects for countries beyond the frontier, including Myanmar, Cuba, and even Iran. Rich with experience and insight, Frontier Investor opens up a whole new world--and worldview--to investors. Marko Dimitrijevic is the chairman of Volta Global and an investment manager with more than thirty-five years' experience investing in emerging and frontier markets. He has invested in more than 150 countries and was one of the earliest Western investors in China, Russia, Indonesia, Bangladesh, and Saudi Arabia. From 1995 to 2015 he managed one of the world's best-performing emerging markets funds, his funds have been included in the "Top 100 Hedge Funds" by Barron's "Top Emerging Market Hedge Funds" by Bloomberg, and "Global Macro Fund of the Year" by Absolute Return magazine. Timothy Mistele is senior managing director at Volta Global and has over thirty years' experience in international investing, including nineteen years working with Marko Dimitrijevic.